Snakes Are Terrorizing Chris Hemsworth and Elsa Pataky's Home—See the Pics! Chris Hemsworth and wife Elsa Pataky have a problem—snakes are taking over their house. Although it was nice to see the Thor star finally join Instagram, it makes us nervous that his initial welcome-me-to-social-media picture was showing off terrifying reptiles. The 32-year-old Australian hunk said hello to his new followers by showing them an Anaconda-like snake that has taken over his backyard. OK, maybe we're exaggerating a bit with the type of snake, but it is huge. "Hangin' with the locals in my backyard…the real Jurassic Park!" he captioned the pic. As if one snake weren't enough for this Aussie's home, it appears that there is a snake infestation. Hemsworth's Spanish model wife also took to Instagram—thankfully not her first post—to show her followers yet another intruder inside her home. "My new house mate!! #Australia #wildlife #lovenature #snakes #vidasalvaje #wildlife #scarymoments #howwegethimout #donttouch #excited," she captioned the pic. She also included a snake emoji, a scaredy cat emoiji and plant emoji. The 39-year-old mom certainly knows how to express herself with a few emojis and hashtags. We hope they were able to clear those creatures out before their three kids saw them! Considering Hemsworth has played a superhero time and time again, we're sure he was able to tackle the reptiles with no trouble at all. Even his Avengers co-star, Scarlett Johansson, couldn't help but gush about him at the 2015 G'Day USA Gala and Australian Academy of Cinema and Television Arts International Awards in February. 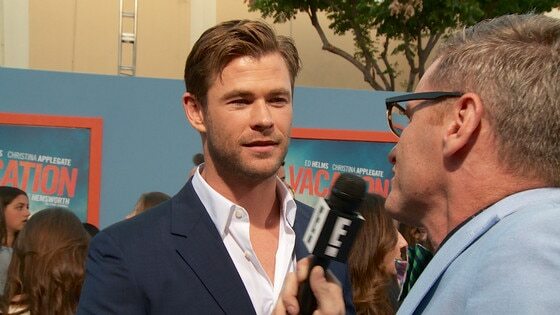 "He's all at once sensitive and ferocious, otherworldly and grounded, is shockingly handsome and is surprisingly approachable," she said of the hunky Hemsworth. "He is every man and like no man you've met before. He is versatile despite his physicality, which makes him a grade-A movie star." With all that "physicality," these snakes must have been nothing for him! PHOTOS: Chris Hemsworth's cutest family moments!